This isn’t a definitive list of what to look out for but it will give you some ideas to help you avoid buying a duffer. The number one problem to look for is rust. You need to check sills; stick your hand behind the sill near the end where it meets the rear wheel arch. If its rotten there, just get back in your car and go home right now. While you’re grovelling on the ground down there, check the rear quarter panel and the rear wheel arch, running your fingers around the inside lip of the arch to feel for filler. 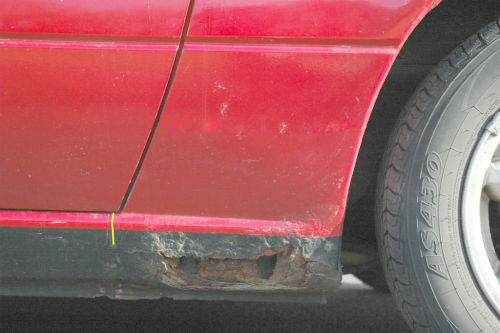 This is the prime area for rust on an MX5. The youngest MK1 MX5 is 20 years old and most are older so its not just straightforward rust that you are looking for. I know many experts say that MX5 sills fall into two categories: they have either been repaired OR will need repairing soon. I can confirm from my own experience that bodywork repairs are going to be present on most older MX5s –especially around the rear sill area. Accept that now and you won’t waste lots of time looking for showroom condition cars. I know that sounds harsh but it’s a reality and if you decide to hang on and look for a car with original, mint condition sills, then be prepared to wait and look for a very long time or pay over the odds for a car. A repaired car isn’t a bad thing: the key is working out how well the any repairs have been carried out. The front end of the car fares much better but look for rust on the front wing where it meets the bumper and check out the windscreen pillars for more rust, though corrosion here is more common on UK cars. Its also worth checking the inside of the bootlid for rust though at least replacement boot lids are cheap and easy to fit, so don’t panic if its not perfect. Talking of boots, check the driver’s side rear wing for a small dent in the middle of the panel. The panel will usually be dented from the inside out and it’s a sign that the battery which lives in the boot, hasn’t been secured down correctly and has moved, causing damage. You’ll need to sort out a battery clamp otherwise it will fail its MOT. If you get on your hands and knees directly behind the car, you can get a good view of much of the underside of the car including the floor pans and sills. While you’re down there, have a good look at the suspension: the rear lower arms can rust terribly (usually much worse on UK cars) and a broken spring is an increasingly common problem now that we have so many speed bumps around. You might notice that there is what looks like a chassis member running along the floor on each side of the underside. In reality, these are not chassis members at all and have very little structural strength: they supposedly add a little strength to the floorpan and they are constructed from very thin metal. Unfortunately, many owners choose to use these as a jacking point and squash them flat. Its not the end of the world and repair isn’t too difficult. Next, have a look at the soft top: does it have cracks or splits above or behind the side windows? And how about the rear window? These are easily damaged. Depending on how bad everything is, the roof may need replacing soon. If you are going to tackle this yourself, budget for around £150 for a new budget vinyl roof (more for a mohair one) and prepare to spend a good 4-6 hours which will involve lots of swearing, misery and general frustration. Or you can get someone else to supply and fit for anything from £300 -£600. Time to have a look inside the car. Check the seat bolsters as these wear badly, especially if it has leather seats. In fact there are very few MX5s with leather seats that don’t have some wear, so don’t let it put you off. Seats can be repaired, re-trimmed or replaced though none of these is particularly cheap. Might be better to accept any minor wear as ‘character’ and forget it. Most of the switch gear will still work fine though the air conditioning (if fitted) will usually only work weakly. It’s a load of hassle getting it repaired or re-gassed so be content with putting the soft top down instead. Try the electric windows next. If one doesn’t work, it will almost certainly be one of the two cables (one to lift and one to lower) that will have snapped. A new cable is around £28.00 but is incredibly fiddly to replace so perhaps a secondhand replacement mechanism would be simpler at around £50-£70. If the windows are simply slow, they can be stripped and greased which helps no end. While you are sitting in the driver’seat, try the headlights to check they raise and lower ok. They hardly ever go wrong but it seems to be one of the things that many prospective buyers really worry about. Probably the most common cause of MOT failure on imported models is not having a working foglight so check that it functions correctly, including the tell-tale light on the dash or switch. Its an item that was often added when the car was imported and the wiring is often atrocious and I make a point of checking the wiring on my cars very carefully as some can be a genuine fire hazard. This is a good time to lift the bonnet. Keep an eye out for oil leaks from the cam cover (new gasket required and not expensive) or a leak from the rear of the cam cover area which is usually an camshaft sensor ‘O’ ring. This daft little item only costs a few pence but can go brittle with age and allow oil to leak everywhere, often looking much worse than it actually is. Its not too difficult to change though. Of course you need to see evidence that the cambelt has been changed in the not-too-distant past. Unless I can obtain proof from the previous owner, I just replace them as a matter of course. A simple belt change is around £200 but it makes sense to change the other drive belts and the water pump while you’re in there which can hike the price. Another area worth checking is the cooling system so remove the radiator cap (engine cold) and check the state of the coolant (you don’t want to see it full of rusty gunge). If it is rusty and horrible, then chances are that there is air getting into the system which means a leak. Could be the radiator or a water pump leaking and on its way out or it could simply be a failed seal on the radiator cap. In any case, it needs sorting out straight away as it WILL let you down when you least expect it. This is a good time to start the engine up and it should fire pretty well first time, every time. There might be some tappet noise on start up and this might persist, especially if the car has been standing unused for some time. However, on your test drive, get the car warmed up and then rev it hard through the gears (if the seller lets you). By the time you get back, the tapping should have disappeared. If not, then it may need a decent engine flush and an oil change and this will cure 99% of tappety engines. It’s a much more common problem on 1.8s by the way. The point is, don’t panic too much as it is usually easily fixed, though it can be a good bargaining point if the seller is unaware of this issue. Talking of a test drive, try not to be over-awed by the whole roof down, wind-in-your-hair-experience and try to actually notice what is going on. There is always going to be a reasonable amount of noise in an old convertible sports car but try and listen out for really odd sounds. For example, noisy wheel bearings which are relatively common or knocking from the suspension which may well be one or more broken springs. A vibration or rattling sound from the exhaust is often down to the heat shields around the cat converter breaking up. A sound you don’t want to hear is that of water sloshing around. It will almost certainly be sills full of water due to blocked drain holes; the holes are easy to clear but the sills may have started to rot if they haven’t been cleared for a long time. Listen out for the engine missing or misfiring under load, usually at lower revs. This is often down to spark plugs that are past their best though the same symptoms can be caused by failing plug leads and in the worse case, by a coil pack that’s on its way out. Plugs and leads are cheap, a new coil pack is not. The gearbox should be nice and precise as should the clutch. The rear brakes can cause fun and games, usually due to a car being left standing for long periods with the handbrake on. So after the test drive, check that the rear calipers haven’t seized (they’ll be hot) and try the handbrake on a hill to see if it holds the car. There is a very specific technique involved in adjusting rear brakes and its easy to blow a good £200 - £300 on new calipers, discs and pads. MX5s hate having odd tyres fitted, especially on the rear. Here’s a quick check worth doing: accelerate reasonably hard and then suddenly lift off the power. You need to look out for the car lurching to one side under power and then back again when you lift off. It almost feels like the rear wheels are steering to some extent and its not a nice feeling at all and can even been downright dangerous. It can be down to incorrect wheel alignment but most of the time, you’ll find that the rear tyres are not of the same matching make. For some reason, this problem appears more often on 1.8s rather than 1.6s. Fortunately, parts on the whole are quite inexpensive and there is a thriving parts after-market as well a number of very good specialist breakers out there. I can’t resist saying that if you buy a car from me, these various faults will either have been put right or I’ll happily point them out to you on a particular car so you know exactly what you are buying in the first place!